Can you put a 4K Genie client into SD mode? I’m not sure why you would want to, but surprisingly, you can. 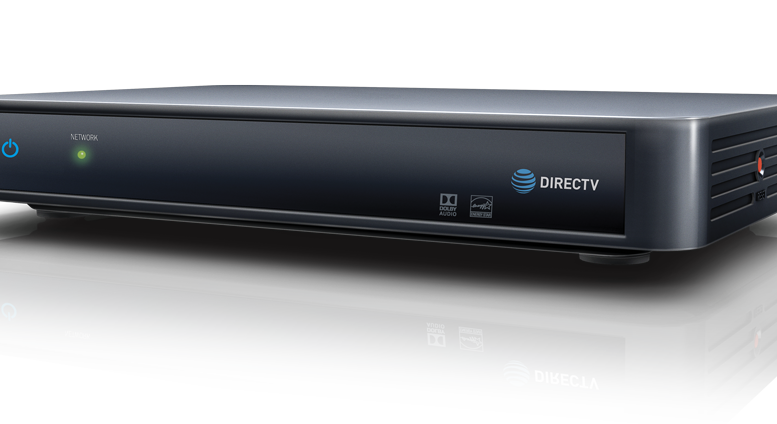 The AT&T 4K Genie Mini Client for DIRECTV gives you the ability to watch 4K broadcasts with a Genie DVR or server. It also works on regular TVs. It’s actually not possible to connect a standard definition source to a C61K client. Unlike other receivers and clients it does not have a connector for standard definition output. However, I’m sure if you tried hard enough you could get the right combination of adapters and cables to make it happen. I’m just not sure why you would. Because you can’t hook a standard definition TV to a 4K client, the display menu doesn’t even give 480i or 480p as a choice. Other clients and receivers give you the option of SD output when you go to the menu and choose Settings, Display, TV resolutions. With the C61K 4K client, the choices start with 720p. I suppose that makes sense. What doesn’t make sense is that there’s still a backdoor way to output 480 content on your HD or 4K TV. Way back in 2012, I discovered a hidden way to change between SD and HD programming. You can read the old tutorial here — it was one of the first ones published on this blog. Back then there were still TVs that had problems with DIRECTV’s copy protection scheme, and this was a way to bypass that temporarily for bars and restaurants. 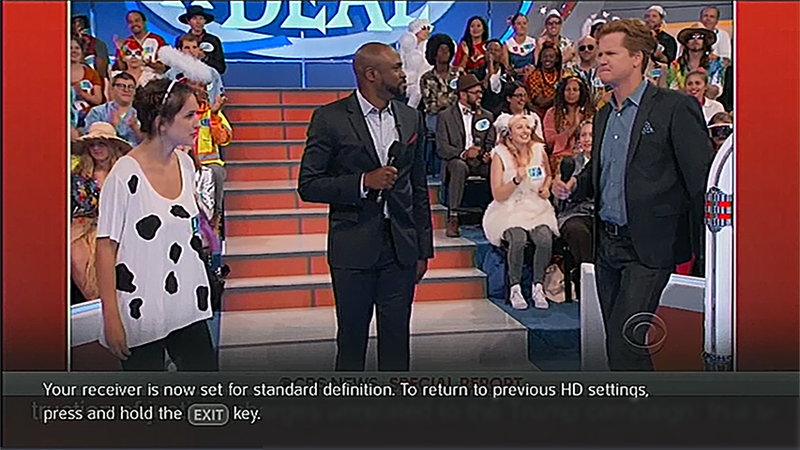 In order to temporarily force an HD receiver to standard definition, you press and hold the EXIT button on a DIRECTV-branded remote. To take it out of SD-only mode, you do the same thing. You have to press the button for about five seconds each time, which seems like a very long time. It turns out this same method works on the 4K client, even on the 4K channels. I’m sure it’s left over from some shared code and was never intended to be used, but it’s there. Well to be brutally honest I’m not sure. I can only think of one reason and it’s basically to win a bet. It’s supposed to show you that if you sit far enough away from the TV you won’t be able to tell the difference in resolutions. For example it’s saying that if you have a 40″ TV and you’re 16 feet from it, you won’t be able to tell the difference between standard definition and 4K. Personally I think that’s actually even a bit extreme. I personally have trouble telling the difference between SD and HD at 10 feet. 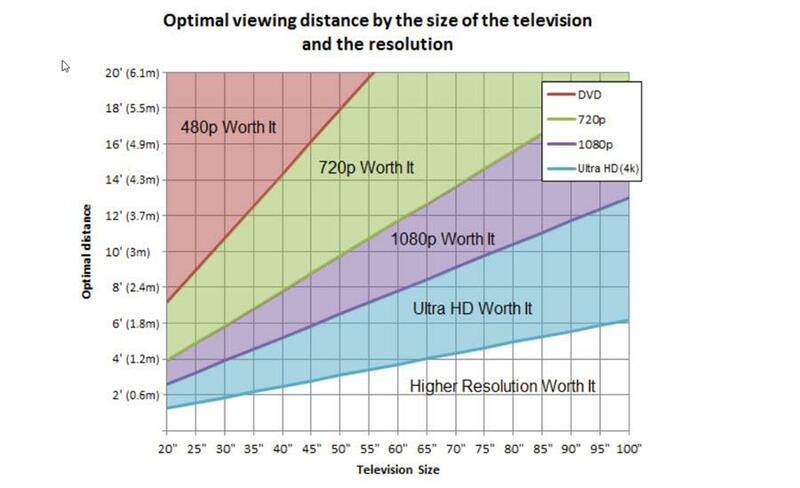 Still, if you want to prove whether this chart is accurate, you could take your 50″ 4K TV and see if you can tell the difference between 480p and 4K at 20 feet. Or, you can see if a friend or spouse can tell the difference. I’m not sure too many people would really enjoy playing this game but if there’s money on the line I suppose everything gets interesting. To get rid of HDCP? This function was originally designed to help bars and restaurants avoid copy protection warnings. The 480p images don’t carry copy protection while HD and 4K video does. This is probably true here as well… I don’t really have a way of telling. However if you’re trying to use a video capture device this may let you at least get “something” where otherwise you’d get nothing. So, enjoy playing with this feature, but it’s probably not worth using very often. NICE AND EASY: Can you use a Wally receiver with an older dish?